The Community Foundation of Bloomington and Monroe County (CFBMC) has announced that $326,700 has been awarded to nonprofit organizations as part of its Community Impact Funding Initiative. 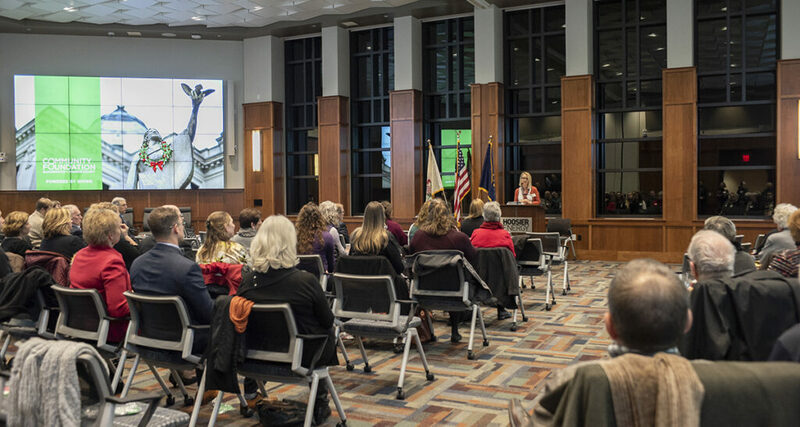 The 13 organizations selected for grants this year were honored at the Community Impact Grant Awards reception on Thursday, December 6, at Hoosier Energy. Grants funded through the competitive Community Funding Impact Initiative aim to strengthen the community by supporting projects that address pressing problems and compelling opportunities in Monroe County. This granting initiative is designed to support a broad range of community needs including arts and culture, social and health services, education, recreation, beautification and preservation, animal welfare, the environment, and community development opportunities. The Community Impact Funding Initiative is funded through unrestricted funds at the Community Foundation and designated field of interest funds established to support particular areas of focus. This year also represents the ninth year that Smithville Charitable Foundation joins the Community Foundation in funding Community Impact Grants. Grants were awarded in amounts ranging in size from $10,000 to $50,000 for a total of $326,700. Bloomington Creative Glass Center to create a new weeklong summer camp targeted for primary school aged children – With an interest in visual arts, the camp will include hands-on and experience activities in glass art and other visual disciplines. Bloomington Playwrights Project to establish the Bloomington Academy of Film and Theatre (BAFT) – In collaboration with Pigasus Pictures and Cardinal Stage Company, the grant will provide funding to establish a new coordinated theatre education program for training in acting, voice, dance, musical theatre, film, and other performing arts. Long-term goals include the growth in the talent pool for both artistic and technical roles. Boys & Girls Club Bloomington to pilot the Youth Mental Health Bridges program at the Ferguson Crestmont Club – In collaboration with Catholic Charities of Bloomington, the grant will fund onsite training of Boys and Girls Club staff and materials to empower staff to better recognize and respond to mental health and behavioral needs of youth members. Staff from Boys and Girls Club Bloomington and Catholic Charities will work side by side in serving club members. Centerstone of Indiana for expanding capacity to serve individuals in recovery who are in need of extended transitional housing – Extended Transitional Supportive Housing is the final state of the continuum of care for individuals with substance use disorder. The grant will provide extended safe and stable housing for individuals in recovery treatment programs, increasing the likelihood of successful long-term recovery, rehabilitation, and reunification of families. Dimension Mill for the REBOOT Fellowship, Intern Summer Camp, and Bloomington’s TechPoint XTern program – The grant will fund programming and marketing for three educational and workplace learning programs aimed at facilitating the growth of a tech-enabled, entrepreneurial talent pipeline in our community. Foundation of Monroe County Community Schools for professional development for early learning professionals working in 27 classrooms across MCCSC – The grant will fund staff development to support all of MCCSC’s early learning classrooms to improve learning opportunities and outcomes for our youngest learners. Indiana Recovery Alliance for a peer harm reduction specialist to build the capacity of IRA to expand access to social services for persons who use substances in Monroe County – The peer harm reduction specialist will support individuals through intensive case management, peer outreach, counseling, individual intervention plans, and connections to available social services. Monroe County History Center to develop the Monroe County Living with History program, a series of museum-based dementia support programs – In collaboration with the IU Health Alzheimer’s Resource Service, the grant will fund staff training and program development to offer access to resources and museum-based archives for people living with dementia and their care partners. Programming will include memory boxes, workshops, a memory café, and self-guided memory walk tours. Monroe County United Ministries to pilot the Self-Sufficiency Center’s Your Path program – The grant will fund coaches, professional development and program materials to aid clients in poverty who are working towards self-sufficiency. Programming will focus on family stability, physical and mental health well-being, financial management, education, and employment. New Leaf – New Life for the Sustainable Volunteering and Training Development Project – The grant will fund development of a sustainable volunteer program to assist incarcerated or ex-offender residents transition back into the community through programs focused on addiction support, education, job counseling, and social services/case management. People & Animal Learning Services to expand a pilot of the Little Bits equine-assisted learning program – In collaboration with Youth Services Bureau of Monroe County and other organizations serving at-risk youth, the grant will provide funding to allow at-risk youth access to riding and horsemanship programming. A focused curriculum will help participants develop essential skills such as listening, understanding, empathy, self-esteem, coping, and trust. United Way of Monroe County to explore the potential for developing a Miracle League baseball field and recreational complex in Monroe County – The grant will fund a comprehensive analysis of the feasibility of a Miracle League field, an accessible baseball complex for children and adults with physical or mental disabilities. This complex and program would service individuals who are excluded from conventional baseball leagues and would greatly benefit from increased opportunities for socialization and recreation. Volunteers in Medicine of Monroe County to continue efforts to become a Federally Qualified Health Center (FQHC) in Monroe County – As a free clinic, VIM cannot serve people experiencing poverty who have insurance, including Medicaid and Medicare. This matching grant will fund legal and accounting work to initiate the process of merging with an existing FQHC entity. Ultimately, the goal is to enable VIM to provide and expand the depth and variety of its medical services to many more low-income uninsured and insured individuals in the greater Bloomington region. About the Community Foundation of Bloomington and Monroe County: Created by individuals, families, and businesses who share a passion for Monroe County and a vision for its future, the Community Foundation of Bloomington and Monroe County has granted $27 million to more than 400 local nonprofit organizations since its incorporation in 1990. With a growing $33 million endowment, the Foundation makes a difference by connecting caring people, important causes and community resources. About the Smithville Charitable Foundation: Inspired by altruism, the Foundation’s main goal is to enrich the lives of those around them by creating opportunities and bringing necessities to communities in its areas of service. As a private foundation, it works closely with community foundations in surrounding counties and supports a variety of causes related to religion, education, health, relief of poverty or distress and various public organizations.